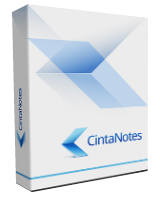 Cinta Notes Pro 3.11 war am 26. Januar 2018! als Giveaway verfügbar! CintaNotes ist ein kleines, jedoch bequemes Tool zum Erstellen und Verwalten von Notizen. Es fühlt sich sofort an als wäre es ein Teil des Betriebssystems. Einfach den gewünschten Text markieren, eine 'heiße Taste' drücken und fertig ist die Notiz! Das Tool ist mit einer blitzschnellen Suchfunktion ausgestattet und kann darüber hinaus Notizen mit Simplenote synchronisieren - für mobilen Zugang. Das leistungsstarke hierarchische Tagging-System hilft euch beim Schnellen Organisieren von Notizen. Ein Muss zum Bewältigen der Informationsüberflutung! Bitte beachtet: Das Programmarchiv beinhaltet unter anderem eine portable Version! Download, Installation & Registrierung - alles problemlos! Danke. ..die, die etwas logisch strukturieren, verlinken und ordnen wollen, werden dieses Programm auf jeden Fall gut finden. WENN -> DANN Regeln können sogar eingesetzt werden - nicht schlecht !!!!! Einziges was ich bemängeln könnte, wäre die nicht mehr ganz zeitgemäße Oberfläche - aber die Funktionen die das Programm bietet, machen das Aussehen dann auch nicht mehr so schlimm. ..die, die etwas logisch strukturieren, verlinken und ordnen wollen, werden dieses Programm auf jeden Fall gut finden. WENN -> DANN Regeln können sogar eingesetzt werden - nicht schlecht !!!!! Einziges was ich bemängeln könnte, wäre die nicht mehr ganz zeitgemäße Oberfläche - aber die Funktionen die das Programm bietet, machen das Aussehen dann auch nicht mehr so schlimm. Ich find's Top ! According to the website, the Pro version is a one year licence. So will this version cease working after a year or revert to the free limited features if $39 isn't paid? Thanks. spyglass, It will work forever for version 3.11, but will not work for any later versions. I have an earlier version from GOTD and I just want to mention here that I am very impressed with the communication I receive regarding updates from the software designer, Alex Jenter. He is constantly working to improve and perfect this software and then keeping me 'in the loop'. That alone speaks volumes to me of this company's credibility and attention to detail. I can only say that about two or three other software programs I use, and I paid big money for those. I have an earlier version from GOTD and I just want to mention here that I am very impressed with the communication I receive regarding updates from the software designer, Alex Jenter. He is constantly working to improve and perfect this software and then keeping me 'in the loop'. That alone speaks volumes to me of this company's credibility and attention to detail. I can only say that about two or three other software programs I use, and I paid big money for those. Thank you, Alex Jenter. I am collecting a lot of snippets from documents and books. It is tedious to swipe, copy, paste to notepad, scroll down, repeat for next, etc. This software installed easily on Win 10, followed directions and license installed easily. Initial problem: it wouldn't accept a text with F-12 which operates my screen brightness. Any variation of F-12 (alt F-12, ctl+alt+F-12, etc.) did not work. Fooling around with Options > Hotkey in the software menu, I accidentally noticed that the hotkey changed when hit a different key on my keyboard. So I selected ctl+down arrow and saved it. Bingo! It worked. Tested with a series of copy actions. The first opened CintaNotes and copied in with ctl+down arrow. All the rest of the copy actions followed. I was initially put off by the fact that each copy was headed with "Giveaway of the Day, Cinta Notes Pro...etc etc. My notes still needed to be in notepad So on the opened CintaNotes I did ctl+A then ctl+C, then ctl+V in an empty Notepad window. Bingo.. all my notes without the headers appeared in notepad, just as they would have if I used the previous tedious method. This is a definite time saver and a keep for me. I am collecting a lot of snippets from documents and books. It is tedious to swipe, copy, paste to notepad, scroll down, repeat for next, etc. This software installed easily on Win 10, followed directions and license installed easily. Initial problem: it wouldn't accept a text with F-12 which operates my screen brightness. Any variation of F-12 (alt F-12, ctl+alt+F-12, etc.) did not work. Fooling around with Options > Hotkey in the software menu, I accidentally noticed that the hotkey changed when hit a different key on my keyboard. So I selected ctl+down arrow and saved it. Bingo! It worked. Tested with a series of copy actions. The first opened CintaNotes and copied in with ctl+down arrow. All the rest of the copy actions followed. I was initially put off by the fact that each copy was headed with "Giveaway of the Day, Cinta Notes Pro...etc etc. My notes still needed to be in notepad So on the opened CintaNotes I did ctl+A then ctl+C, then ctl+V in an empty Notepad window. Bingo.. all my notes without the headers appeared in notepad, just as they would have if I used the previous tedious method. This is a definite time saver and a keep for me. Different people have different needs. I tried many note-taking programs, and dismissed One Note right away, because the free version compels you to store your notes on Microsoft's cloud, where Microsoft can read them. The paid-for version, on the other hand, is horrendously expensive. Besides, I don't have any "devices". Just a computer, so no sync needs. I found Cinta Notes uniquely able to clip information from the Web with all its meta data (links, date, title...), store it and search it. It's priceless for knowledge management. There might be other programs with similar capabilites, but I have not found any. Cinta Notes is currently a text-based program, but then, text is where serious information is. If you need to retrieve images or video, this is made easy because Cinta Notes saves all links, too. So they are but a click away. Mark CM, Different people have different needs. I tried many note-taking programs, and dismissed One Note right away, because the free version compels you to store your notes on Microsoft's cloud, where Microsoft can read them. The paid-for version, on the other hand, is horrendously expensive. Besides, I don't have any "devices". Just a computer, so no sync needs. I found Cinta Notes uniquely able to clip information from the Web with all its meta data (links, date, title...), store it and search it. It's priceless for knowledge management. There might be other programs with similar capabilites, but I have not found any. Cinta Notes is currently a text-based program, but then, text is where serious information is. If you need to retrieve images or video, this is made easy because Cinta Notes saves all links, too. So they are but a click away.